Easy Road or Hard Slog? 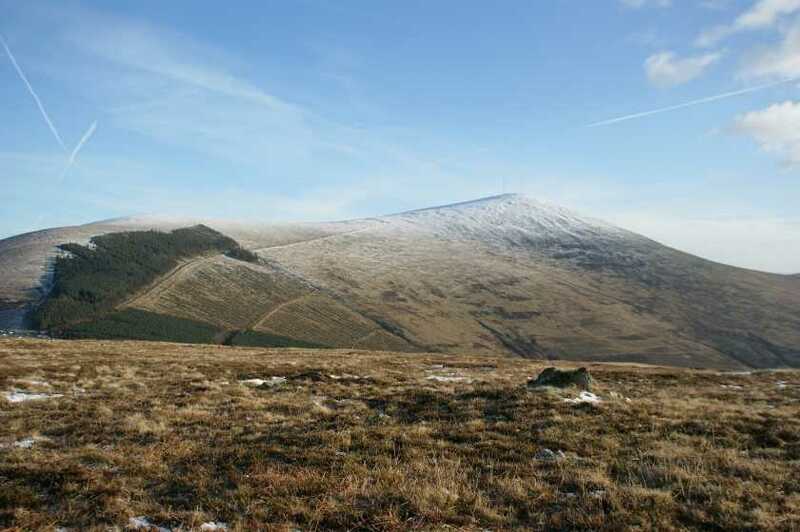 Mount Leinster, at 794m, is the highest point of both Carlow and Wexford, but despite the name, not of Leinster. Unusually for such a big hill, there is a road running all the way to the top in order to service the array of masts on the summit. This road, although restricted to official vehicular traffic, does provide the easiest and the overwhelmingly most popular walking route to the top. The road begins at a viewing point on the South Leinster Way at S81645 54640 A, where there is parking. The viewing point is at a height of some 400m, leaving a climb of around another 400m. Walk up the road to the south, a distance of 2.25k to the summit. Up and back should take about an hour. A more interesting ascent is from the east, starting at Ballycrystal S860 506 B, heading north to Black Rock (not a MV listed hill), then west over Mount Leinster East Top and onto the main top. A return trip is c. 4 hours. Some parking is also available at S843 516 C which provide a short, but steep ascent directly to the summit or an alternative point for a second car. Another potential starting point is from Rathanna Bridge at S800 503 D, heading north east through a small forest, onto the ridge with Knockroe and thence to the summit. A c. 3 hour round trip.